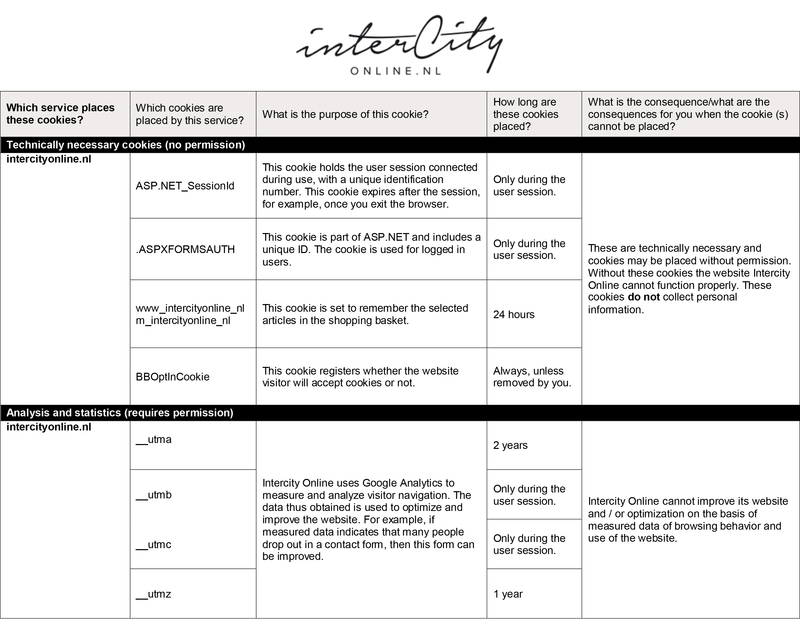 Which cookies does Intercity Online use? Click here to see the cookie table. Our website utilizes cookies from Google as part of its Google Analytics service. The data collected via this service is used to improve our website. For example: if statistics show a low conversion rate for a contact form, improvements may be made to make the form less complicated. Google may be forced by law to supply information to third parties. These regulations are outside of Intercity Online’s jurisdiction . You have a right to ask for a copy of your personal information that we have collected at any time and to have that information corrected in case it’s inaccurate. You may also submit a request to have all your personal information removed. If the information pertains to data that is held by a cookie, we ask you to submit a copy of the cookie in question. You will find all cookies in the privacy settings section of your browser.